Pale bright straw green color. Floral aromas and flavors of roses, lychee, and spiced oranges and peaches with a satiny, bright, fruity medium body and an effortless, interesting, medium-length finish evoking accents of poached pear and apple, flower patch earth, and vanilla cream with fine, fruit tannins. A bright, floral white with nice poise and delicacy. Bottom Line: A bright, floral white with nice poise and delicacy. 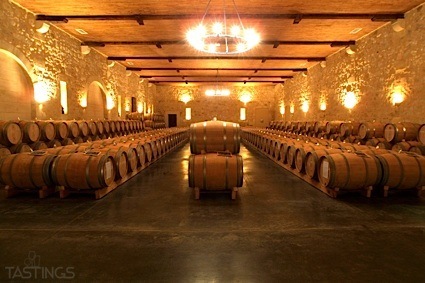 There is a great deal of white wine produced in Bulgaria, most of it inexpensive and produced from international varieties such as Chardonnay, Sauvignon Blanc and Viognier. There is also some white wine made from a local variety known as Dimwit, which produces sweet wines that are meant for early consumption. In general, Bulgarian white wines are meant to be consumed young, to emphasize their freshness. 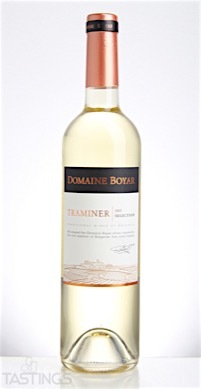 Domaine Boyar 2015 Selection, Traminer, Thracian Valley rating was calculated by tastings.com to be 92 points out of 100 on 9/28/2016. Please note that MSRP may have changed since the date of our review.